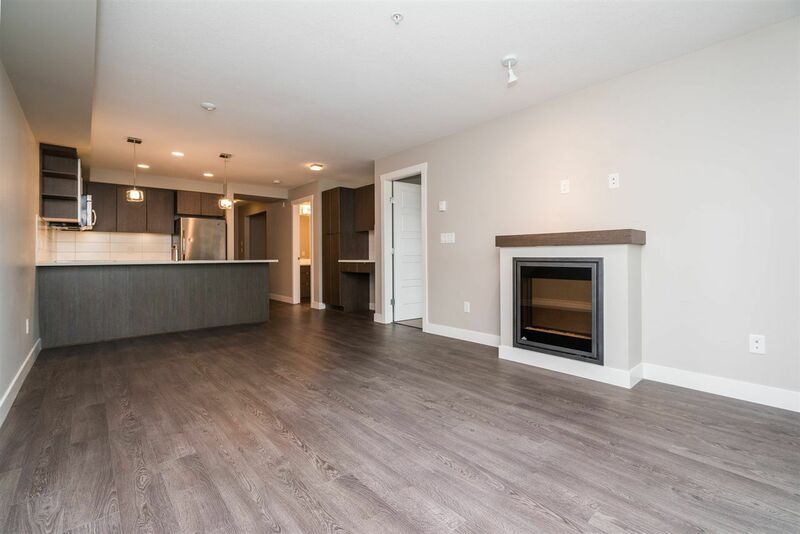 LARGEST 1 BEDROOM & DEN + 2 BATH FLOOR PLAN IN BEARING POINTE! Kitchen features stainless steel appliances, contemporary full wrap cabinets, under cabinet lighting & caesarstone countertops. Built in floor to ceiling pantry plus computer nook. Located on the quiet side of the building with a cozy built-in fireplace & access to your covered deck. Bright Master Bdrm with his/her closets & 5 piece ensuite. DEN IS THE SIZE OF A BEDROOM AND HAS A HUGE CLOSET. In suite laundry along with a 2 piece powder room for guests. ONE OF THE LARGEST BALCONIES IN THE BUILDING. Secure well lit parkade w/ security camera. 2 pets & rentals allowed. Absolutely gorgeous building in a convenient location within minutes to shopping, transit and parks!